Paper-based COPD discharge bundles were implemented in our trust (a large tertiary centre in the West Midlands) in 2013, with disappointing completion rates. 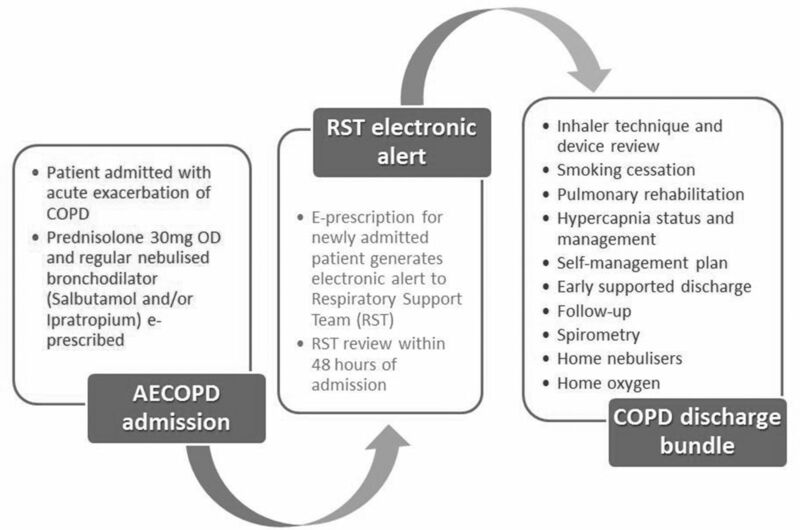 In order to improve compliance, an electronic bundle (e-bundle) was introduced This uses a novel system (Figure 1) that electronically alerts our multidisciplinary respiratory support team to potential AECOPD patients when medications for AECOPD are electronically prescribed (e-prescribed). The aim of this audit was to see whether completion of COPD discharge bundles in this trust has improved since the e-prescribing alert system and e-bundle implementation in 2015. Methods Admissions coded as AECOPD were retrospectively identified using ICD-10 codes for a three-month continuous period in 2015. Discharge summaries and e-bundles for each patient were accessed via online records, and in patients who were bundle-appropriate, data were collected on the presence or absence of a bundle, and completion of its 10 individual elements. Results In 2015, 125 admissions coded as AECOPD were identified; 93 were bundle-appropriate. 80% of these had a COPD discharge bundle in the electronic record; a significant improvement on the 38% bundle completion in bundle-appropriate patients in 2013 (p < 0.0001). Percentage completion was >90% for seven of the ten elements included in the 2015 e-bundle. Direct comparison of the six points included in both the 2013 paper bundle and the 2015 e-bundle, revealed that more patients were assessed for pulmonary rehabilitation in 2013 (100% vs 92%, p = 0.0417); all other elements had no significant change in completion rates. Conclusions Introduction of an e-bundle and e-prescribing alerts to respiratory support team members more than doubled completion of COPD discharge bundles. This clearly shows the benefit conferred by use of an electronic system for prescribing, referrals and bundle proformas. We advocate the increased use of e-bundles as electronic prescribing and information systems are introduced across trusts. Hopkinson NS, et al. Designing and implementing a COPD care discharge bundle. Thorax 2012;67:90–92.